NBC Digital Entertainment and NBC Universal announced today plans to expand their on-demand streaming offerings, mining the wealth of decades of old television programming. 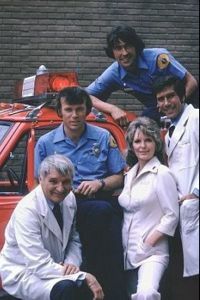 Full episode streaming of “classic” series including “The Alfred Hitchcock Hour,” “Kojak,” “Miami Vice,” the original “Battlestar Galactica,” “A-Team” and “Emergency” (Kevin Tighe and Randolph Mantooth? Squeeeeeee!) will be offered on NBC.com, SCIFI.com, ChillerTV.com and SleuthChannel.com beginning this month. “We are very excited to re-introduce these classic shows to a new web audience,” said Vivi Zigler, Executive Vice President, NBC Digital Entertainment. A (recently resolved) three month long writers’ strike has sharply curttailed the number of fresh episodes of US television content this season, and more people are abandoning network television and seeking out video content online. This move to take mothballed vintage content and make it available on demand gives NBC and its subsidiaries another small grasp at keeping existing viewers and adding new ones.